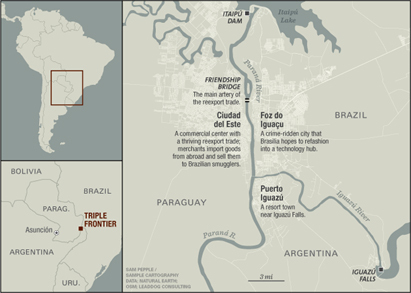 South America’s Triple Frontier, where Argentina, Brazil, and Paraguay meet at a bend in the Paraná River, has long served as a hub of organized crime and narcotics, weapons, and other contraband smuggling. For decades, these borderlands have been home to a large and thriving Arab merchant community. The area first came to Washington’s attention following the 9/11 attacks when security experts suspected jihadists were taking safe harbor there. U.S. officials jumped in, with programs to combat criminal activity, improve intelligence, and strengthen rule of law. But they failed to turn up any terrorists. In fact, their interventions did little to curtail the broader lawlessness that plagues the region. But now, because of an economic downturn, the very group suspected of harboring terrorists might be the one to finally clean up the Triple Frontier. From this month’s Foreign Affairs.